What is the common point between the fall-winter ready-to-wear collections for 2014-2015 from Anthony Vaccarello, Balenciaga, Balmain, Blumarine, Cedric Charlier, DKNY, Gucci, Guy Laroche, Jason Wu, Lanvin and Moschino ? All these brands rely on leather. On perfectos, dresses, skirts, belts, pants, chest protectors, Teddys, the skin is everywhere. It is used in super-soft variations, or can be rigid and sculptural. Leather means a return to natural materials and to manual labor from the past. 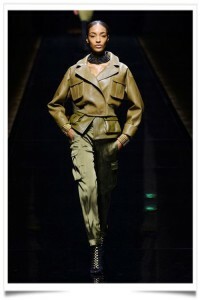 It is combined with other materials such as fur, wool, big zips, cotton, cashmere and velvet. Regarding the colors, this Winter you will be in black and grey. However the trend is khaki (Balmain), blue (Blumarine, Guy Laroche), powder pink (Gucci), camel (Guy Laroche) … enhanced with touches of red or white. This entry was posted in BREAKING MODE, BREAKING NEWS, Uncategorized and tagged CANAL-LUXE, modeaparis, MODEPARIS by admin. Bookmark the permalink.